During each evening we will iluminate our library in solidarity with Grenfell. On Wednesday 13th June we invite people to come and make personal creative offerings such as hearts and written messages to decorate the side of the Library walls facing Ladbroke Grove. An art table and materials will be available for people to use, people are aslo very welcome to bring art they have made at home or in school to add to the decorations. To ensure the community day runs safely and smoothly we need some volunteers to help coordinate throughout the day. If you want to help please leave a message at the library or just turn up on the day. This is a Friends of North Kensington Library community led event with the full support from the Library. For Grenfell and inspired by #Green4Grenfell Shine a Light initiative: Gofundme. 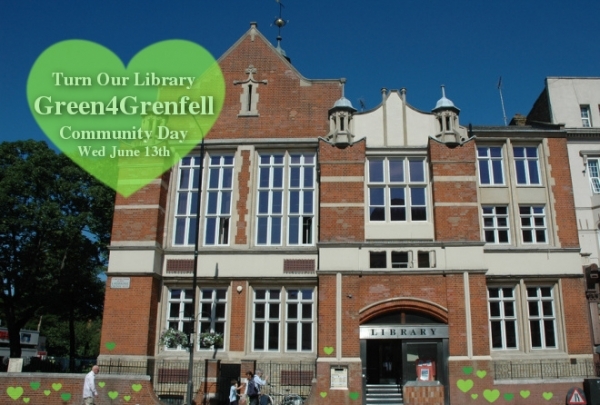 From the 14th-18th of June North Kensington Library is going #Green4Grenfell.